The dual role of OX40 creates a tumor microenvironment that is more conducive to the initiation of anti-tumor immune responses. Our own-developed humanized mouse model of OX40 provides a powerful tool for further research on the efficacy, potency and adverse effects of OX40-related drugs. Unlike traditional immunodeficient mice, humanized OX40 mice not only carry human OX40, but also have a complete immune system and are therefore a more relevant, reliable, and accurate type of model. 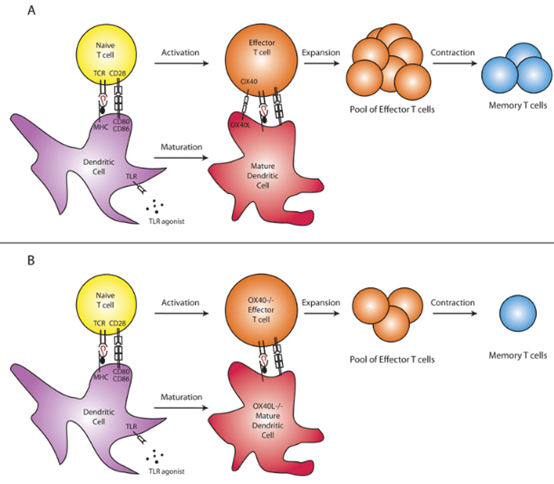 The stimulation of T cells by antigens undergoes four phases, including activation, expansion, contraction, and the development of long-term memory. Upon antigen stimulation, naive Ag-specific T cells proliferate and form a pool of effector T cells. When the antigen is removed, antigen-specific T cells contract and leave a small population of memory T cells. OX40 is a costimulatory molecule expressed on the surface of activated cytotoxic T cells and regulatory T cells (Treg cells). The interaction of OX40 and OX40L has been reported to recruit TNFR-associated (TRAFs) molecules to the intracellular domain of OX40. TRAF2 and 3 can activate the classical NF-κB1 pathway or the non-canonical NF-κB2 pathway, both of which are critical for cell survival. OX40 signaling can increase the ability of activated CD4 + T cells to secrete cytokines, such as IL-2, IL-4, IL-5, and IFN-γ. It has been clearly demonstrated that OX40 signaling can enhance the development of Th1 and Th2 cells. T cells stimulated by OX40 also increase the expression of receptors, such as IL-7Rα (CD127), IL-2Rα (CD25) and IL-12Rβ2, associated to the survival of T cells. 图1. OX40/OX40L interactions impact the four phases of the T cell lifespan (Jensen et al. 2010). It is well known that the role of Tregs is to restrict immune responses. OX40-OX40L signaling can reduce the production of Tregs and block the ability of Tregs to inhibit T cells. By inhibiting the immunosuppressive effects of Tregs and limiting the size of Treg population, OX40 can further amplify the activation of T cells. 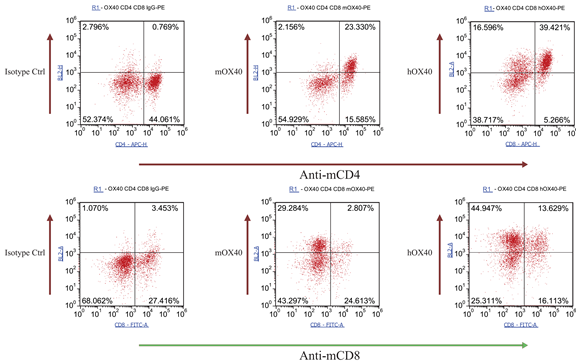 The administration of anti-OX-40 agonistic antibodies increases the proliferation of CD4 + and CD8 + T cells in the peripheral blood, increases the response to recall naive T cells, and increases the level of endogenous tumor-specific immune responses. Currently, several competitive anti-OX40 agonistic antibodies have been tested in early clinical trials for cancer treatment, and the accumulated preclinical evidence supports their value in cancer therapy. It is well known that the dual role of OX40 creates a tumor microenvironment that is more conducive to the initiation of anti-tumor immune responses. Our humanized mouse model of OX40 provides a powerful tool for further research on the efficacy, potency and adverse effects of OX40-related drugs. Unlike traditional immunodeficient mice, humanized OX40 mice not only carry human OX40, but also have a complete immune system and are therefore a more relevant, reliable, and accurate type of model. On the C57BL/6J genetic background, the coding sequences for the extracellular domain of human OX40 and the transmembrane and intracellular domains of murine Ox40 were inserted into the ATG position of the mouse Ox40 gene, so that the expression of endogenous Ox40 in the mouse was replaced by the expression of humanized chimeric protein. Figure 3. Expression of OX40 in the spleen lymphocytes of humanized OX40 mice is detected by FACS. The spleen lymphocytes of heterozygous humanized OX40 mice were activated by anti-CD3 and anti-CD28 for 48 hours, and then collected for staining. Along with a group undergoing no stimulation, the expression of murine and human OX40 was detected by FACS. The results showed that the active expression of human OX40 can be detected in both activated CD4+ and CD8+ T lymphocytes collected from heterozygous humanized OX40 mice, and the expression trend of human OX40 and murine Ox40 was similar. In vivo validation in a MC38 tumor-bearing model of humanized OX40 mouse. Figure 4. In vivo validation of anti-tumor efficacy in a MC38 tumor-bearing model of humanized OX40 mice. Heterozygous humanized OX40 mice were inoculated with MC38 colon cancer cells. After the tumors grew to 100 mm3, the animals were randomly assigned into a control group and a treatment group (n=8). The results indicated that the antibodies targeting human OX40 showed a very significant antitumor effect (p<0.001). 1.Jensen S M, Maston L D, Gough M J, et al. (2010, October). Signaling through OX40 enhances antitumor immunity. Seminars in oncology (Vol. 37, No. 5, pp. 524-532). WB Saunders. 2.Ito T, Wang Y H, Duramad O, et al. (2005). TSLP-activated dendritic cells induce an inflammatory T helper type 2 cell response through OX40 ligand. Journal of Experimental Medicine, 202(9), 1213-1223. 3.Webb G. J.; et al. 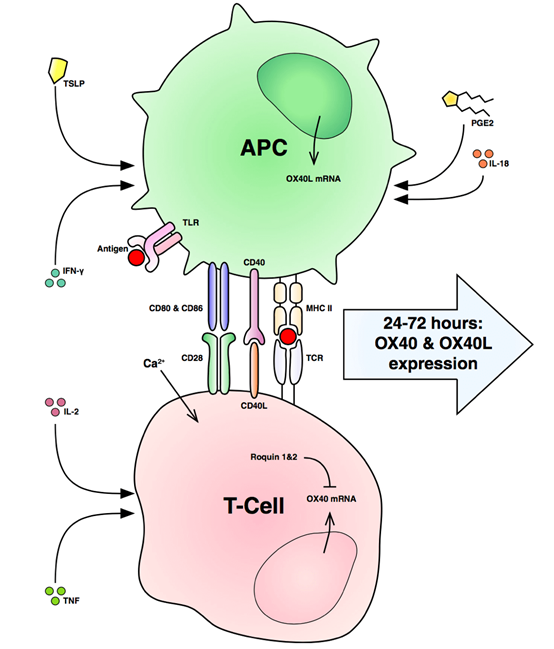 OX40, OX40L and autoimmunity: a comprehensive review. Clinical reviews in allergy & immunology. 2016, 50(3): 312-332.